Not another invitation! Occasion wear on a budget. Why is it that we find ourselves inundated with various invitations during the peak summer period, whether it be a friends wedding, an engagement party, a birthday or graduation? Every year I find myself spending more and more on various outfits I probably won’t wear again. According to a survey of 2000 people by the nationwide building society, the average wedding guest will spend around £377 for each wedding they attend! That’s just madness, especially when I have a beach holiday booked for August and the spending money fund is looking rather low! So I went on a challenge to find occasion wear on a budget, and what I found was pleasantly surprising. So, you have a summer wedding, you have already shelled out on travel, hotel and gift and yet you still need an outfit. 2. Your outfit should not be too over the top – this is a wedding not a nightclub! 3. Don’t stress about a hat. It may have been tradition twenty years ago but it’s not a must these days! When I was looking for that perfect wedding outfit I came across this new (Yes new) Eucalyptus London dress. 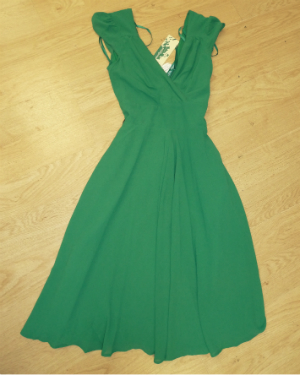 It features a flattering V neck and the deep jade green colour will help you stand out from the crowd. Perfect accompanied with silver accessories. I simply love the vintage feel of this dress. Why does it feel like everyone you know has their birthday during the summer? Don’t get me wrong, I love a party but it does get challenging sporting a new outfit each time and the last thing you want is to be tagged on Facebook in the same outfit…….Imagine!! There are so many different dresses to be found in Barnardo’s stores, and at such a reasonable price that you can afford to stock up on several party ensembles. I found this little sparkly number for a mere £8.99. I just love the sequins. You can also never go wrong with a little black dress at a party, however for the more daring, a bright coloured dress works really well. I picked out a bright pink Missguided Peplum style dress. Summer is often the time for graduations. Whether it be someone you know or yourself that is graduating, a special outfit is a must. Even more importantly you will have to look at that graduation picture for years to come so it’s essential that you choose an outfit you won’t spend years cringing at! A classic ball gown is always a safe choice. Whether you choose a floor length gown or something a little more modern, you are guaranteed to look the part. A simple gown can easily be dressed up with a statement necklace or earrings, but it’s important to keep it elegant, so avoid anything too casual. I hope that’s given you food for thought to sail through the summer events in style but on a pretty impressive shoestring!